A couple of weeks ago, Twitter started it all with a link to this post by Shannan at Flower Patch Farmgirl. 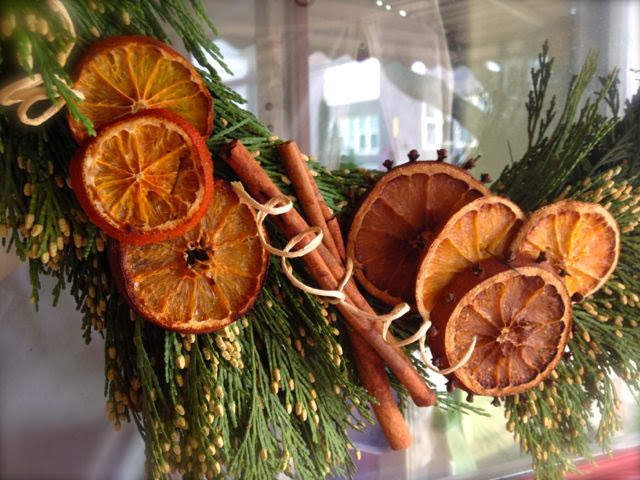 In it, she tells how she dried orange slices to make an orange garland. Cute! It reminded me of this cool curtain of dried oranges at Allan Gardens three years ago. A couple of soggy-sided oranges sat on my counter, destined for the Green Bin. Perfect for an experiment. Ah, but how imperfect is memory. 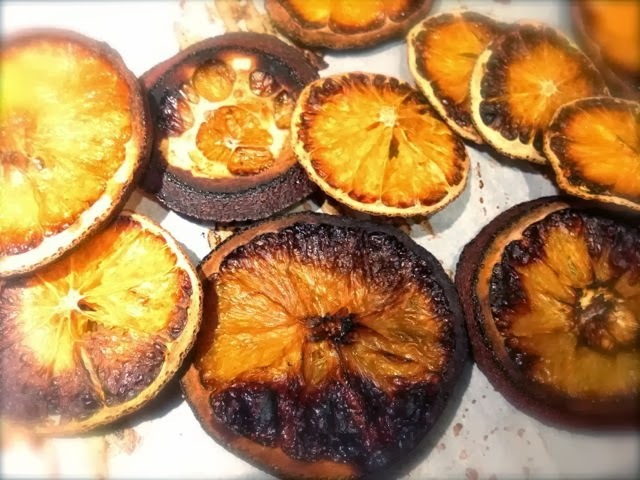 Only vaguely recalling Shannan’s instructions, I arranged 1/4″-thick orange slices on a baking sheet covered with parchment in an oven heated to 350˚F (177˚C). Some time later, my daughter called out, “Mum! Your oranges!” It was clear how I’d goofed: Not 177˚C but 175˚F (80˚C). The oranges were… no longer orange. Let that be a lesson to me. Lesson one: Read the instructions carefully. A selection of rejects from my first two batches. Some clementines whose skin had turned dry gave me a second chance. (When all three kids lived at home, a box of clementines would last two days. Remind me not to buy clementines in boxes.) This time, your impatient guide set the oven on 250˚F – but watched carefully, flipping the slices every half hour or so. After three hours, most were ready, though some had darkened near the edges. 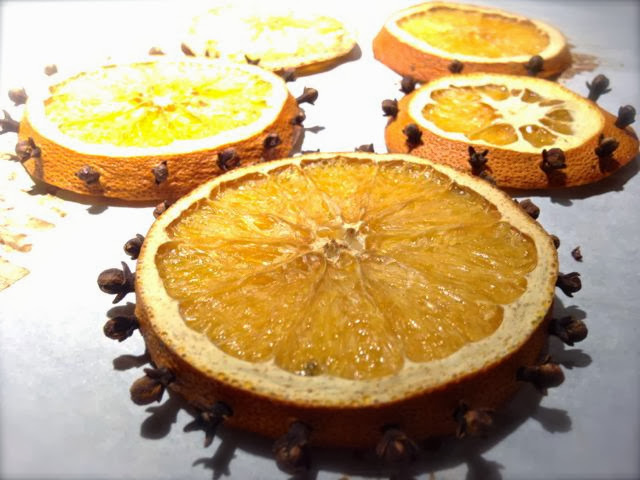 The orange fragrance was lovely while they were drying, but the finished slices are only fragrant-ish. Around the same time, I had bought a bunch of incense cedar boughs (Calocedrus decurrens) from Fiesta Gardens. Studded with numerous, tiny, yellow-green immature cones, the boughs are highly decorative. Thinks me: I’ll use it all to make my own fragrant wreath! Learn from my mistake. The wood, not the foliage, earned incense cedar its name. The boughs do smell pleasantly green, however. Batch three provided a few larger, feature slices. Each was thicker and studded with whole cloves first, then put in a 225˚F oven. As Shannan points out, energy conservation isn’t a big component of this craft. We’ll try to do better next time. 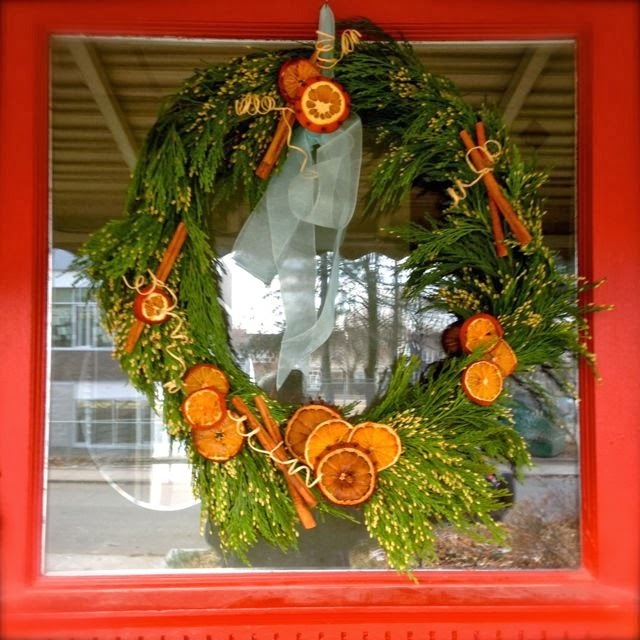 Now, with most of the ingredients assembled, I began to wire the boughs to a wreath frame salvaged from a store-bought evergreen wreath some years ago. 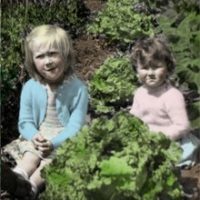 See, we’re not all about waste at Toronto Gardens. 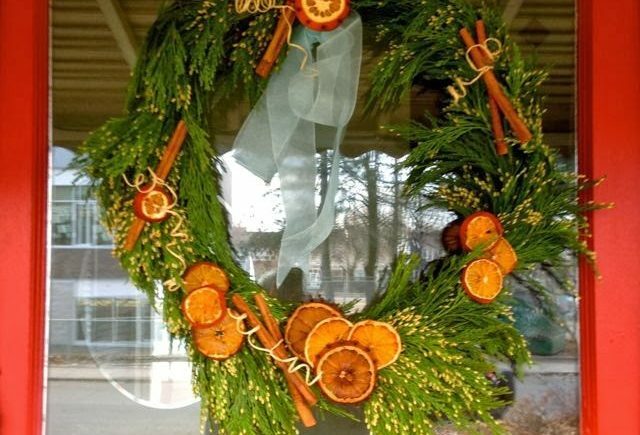 If you do buy a wreath ready-made, don’t throw the frame away afterwards. Save it. For the past three years, this frame had been dressed in bright red feathers – wrapped in a boa repurposed from a Value Village Hallowe’en costume – and different accents. One year, silver balls; another year, wicker balls in yellow, red and green from Dollarama. Very cheap and always cheerful. Now the fun part: arranging the decorations. At this stage, I saw we needed some large feature slices and cinnamon sticks. In a container, few evergreens beat incense cedar for drape. Trying to attach the incense cedar to the frame with floral wire, however, showed why it’s often an accent to stiffer boughs such as fir or spruce. It’s floppy. One bunch covered the frame, overlapping cut ends with soft foliage. But gravity worked against my vision of seamless overlaps, as you can tell from the wire bunching the boughs at the lower right, above. On the other hand, it suits the informal, homey look of the kitchen materials. 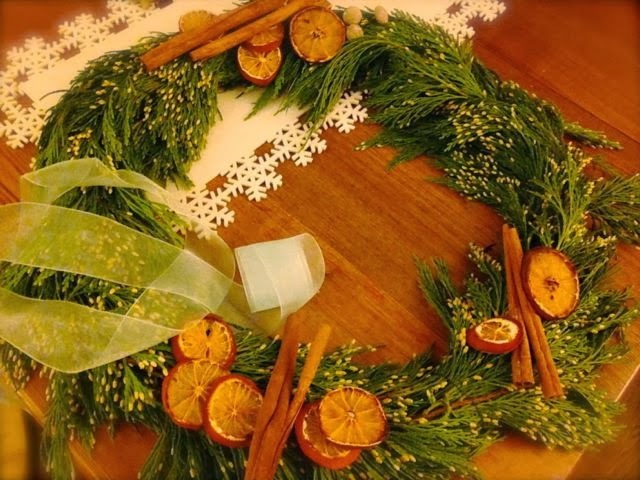 Once happy with their placement, I stitched the oranges and cinnamon to the wreath with floral wire. A long piece of beachglass-blue organza ribbon saved from gift wrap – our gran taught us well – became my bow. Not a traditional Christmas colour, but it worked with the other materials. Et voilà! Not particularly fragrant, except perhaps with the sweet smell of success. What do you think? The finishing touch: a few exclamatory squiggles of paper-wrapped wire around the cinnamon sticks. With the wisdom of hindsight, I should have layered the branches so that they all draped downwards from the top centre, like a classical laurel wreath. That might have solved my gravity problem. Next time! Despite the burnt oranges and your issues with gravity the wreath turned out quite nicely. Happy holidays and all the best for the new year! Thanks, Jennifer! And to you, too. What a creative twist ! i net the aroma was a nice citrus one too. It does have a lovely fragrance when you get up close when opening the door. The orange-clove-cinnamon-cedar blend is right at nose height.